The Great Experience, watching Yadnya Kasada Ceremony at Bromo. Enjoying and knowing directly Yadnya kasada ceremony at Bromo or Kasodo festival will be such the unforgettable moment in life. That will be such a good idea for you to enjoy it if you are really interested in enjoying the various unique culture and even tradition. That will be such the fun things to be enjoyed. Perhaps, it is a good idea for you to plan your fun vacation at Mt. Bromo and watch directly this ceremony. That will be such the amazing experience we can get there. If Bromo is one of your dream destinations to go for your vacation, of course you have known about the beautiful nature there, beautiful sunrise, and even the unqiue culture and tradition there that also comes from Hindu Tengger tribe that becomes the native tribe there. Sure, their culture and tradition is still maintained well so that we can see how unique the culture and tradition of Tengger tribe is. That can be done by watching their ceremonies directly there as like the yadnya Kasada. That is one of the great ceremonies of Tengger Tribe and becomes their feast day as the Hindu religion believers. If you are really in love with the great culture and tradition, Yadnya kasada ceremony at Bromo watching directly is the recommended idea. Actually, this is the Hindu ceremony in their feast day. 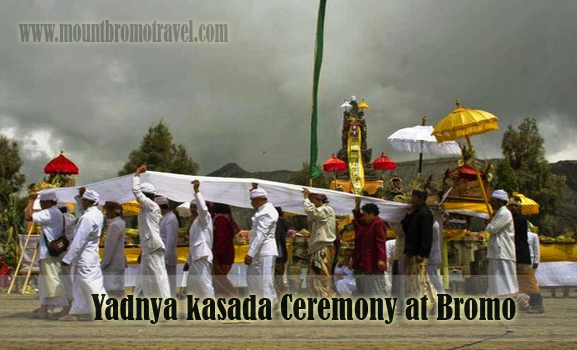 This ceremony does not only conduct at Bromo but also Bali. However, of course each of them has the unqiue characters of the ceremony which is held. This is also called as Kasodo ceremonial event. That is held every the month of Kasada in the day of 14th. That is based on the Hindu Calendar of Tengger Tribe. The ceremony is as the appreciation to Sang Hyang Widhi. That is held in Pura Luhur Poten. Visiting Mount Bromo to enjoy the culture and tradition of the Tengger Tribe is a good idea in addition to enjoy the beautiful nature and sunrise there. Of course, you need to plan that well earlier. You need to find the info about when the event of the Yadnya Kasada Ceremony will be held. Then, you can make sure that you can get the off duty time or not. If yes, go on to book for the flight, transport, and even accommodation there.